We are here for your flat roof repairs and replacement. We not only give expert customer service but also offer no obligation quotations. Whether you live in Derby, Chesterfield, Mansfield or any area in the East Midlands we provide a proven product which is great value for money. Due to a lack of flexibility, roofs today weather faster resulting in roof repairs or replacement. If you're looking for roofers in Derby, Chesterfield, Mansfield or anywhere surrounding, please contact us. If you are looking for a flat roofing contractor around the Burton on Trent or East Midlands area, then why not give Derbyshire Rubber Roofing a call. We offer a very high standard of workmanship at all times and with our excellent record for health and safety we are your first choice for all your commercial and domestic roofing needs. 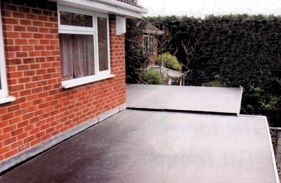 All of our flat roofs are guaranteed. If you are looking to replace your flat roofing, or build a new flat roof, Rubber roofing systems have a life expectancy of over 50 years! It also repels moisture, its durable, is tear resistant, can withstand extreme weather, looks natural, hides dirt, doesn't support moss growth, easily bends, and gives your flat roofs a superior finish.